Ormat Technologies is in the recycling business, "recycling" otherwise unused heat energy to produce electricity. When it comes to generating energy, Nevada's Ormat Technologies Inc. could truly be said to be adding value--the company's recovered heat technology produces electricity by "recycling" otherwise unused heat energy. Recently, an independent power producer in Western Canada ordered three Recovered Energy Generation (REG) power plants from Ormat. The three REG power plants will be used on the Alliance Pipeline and each facility will have a capacity of 5 MW net. The pipeline is a major facility. From its gathering system in the Canadian provinces of British Columbia and Alberta, Alliance transports 1.325 billion cubic feet (BCF) of natural gas through its 2,310-mile pipeline system, traversing British Columbia, Alberta, Saskatchewan, North Dakota, Minnesota, Iowa and Illinois, to the Chicago hub every day. The REG power plants will convert the recovered waste heat from the exhaust of existing gas turbines into electricity. The contracts total $29 million, and the three plants are expected to be commissioned in 2007 or early 2008. The Canadian company is just one of many in North America turning to Ormat's REG power plants to recycle otherwise unused heat energy. In January 2006, an Ormat subsidiary entered into a 20-year power purchase agreement with Puget Sound Energy for the supply of power from a recovered energy generation facility, to be located adjacent to the Sumas Compressor Station of Northwest Pipeline Inc. in Sumas, Washington. The facility is expected to begin commercial operations in the fourth quarter of 2007 and is expected to have a generating capacity of 5 MW and annual revenues of approximately $2.3 million with a one percent annual escalation. "By applying technology developed and proven in Ormat's primary geothermal power business, we have jump-started our increasing REG market," explains Colin Duncan, manager of heat recovery at Ormat. "Right now we have six plants with approximately 33 MW of capacity in operation in North America, another 10 MW under construction and another 15 MW under contract." The reason for the technology's growth is simply its numerous benefits: it utilizes heat that otherwise would be released into the atmosphere; the process emits virtually no emissions; it doesn't use water; it runs automatically; it has a very low profile; and a smaller than 100-foot by 200-foot footprint for a 5 MW facility. Ormat's technology offers a number of benefits. It utilizes heat that would otherwise be released into the atmosphere, the process emits virtually no emissions and it runs automatically. The Canadian power plants will be similar to many others currently in operation. Ormat has also contracted with Alliance Pipeline Limited Partnership in Western Canada for an Ormat REG power plant for $9.1 million. This power plant will have a design capacity of 5 MW net and will utilize recovered waste heat from gas turbines driving compressors on the natural gas pipeline. The REGs are installed within the fenced area of an existing gas compression station. "We have identified recovered energy-based power generation as a significant market opportunity for us in the United States and throughout the world," says Duncan. "We are initially targeting the North American market and we intend to leverage our success in that market to expand operations throughout the world." The REG system is based on the company's Ormat Energy Converter (OEC) technology. The process itself is fairly straightforward, and its operation is similar to that of a steam plant. The exhaust heat from the gas turbine compressors, which is normally vented out into the atmosphere, is captured and directed into a "waste heat oil heater" (WHOH). The exhaust heat stream runs over the WHOH pipes and heats the thermal transfer oil. 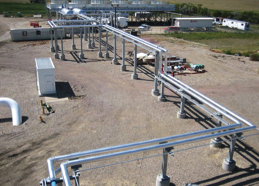 The heated oil is then pumped through pipes to the Ormat Energy Converter (OEC), which takes the heated oil and transfers that heat energy to the working fluid--pentane. The pentane is heated until it vaporizes and these vapors expand to drive a special organic turbine. The turbine drives the generator, which in turn produces electricity. process, the system is free of the moisture-related problems that occur with condensing steam turbine systems. The vital component of this system, however, is the OEC. It's a complete modular power plant unit, specifically designed for low to medium temperature heat sources. 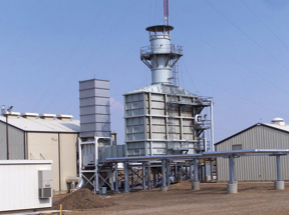 It includes the turbine, generator, control system, a self-enclosed heat exchanger which transfers the heat from the oil to the pentane working fluid, the preheater, condenser, vaporizer and recuperator. This technology isn't new to Ormat, which has been actively involved in the development and manufacture of innovative alternative energy power systems since 1965. Ormat has pioneered the use of organic working fluids for power systems like this. The systems are generally referred to as utilizing the Organic Rankine Cycle (ORC). During the past 37 years, Ormat has produced more than 800 MW of geothermal and heat recovery power plants as well as over 2,600 Remote Power Units (RPU) in 71 countries. "Currently our most economic REG facilities range from about 2 MW to 15 MW," says Duncan. Ormat has also found that the REGs are ideal for remote locations, where continual, automatic energy production is needed. For the REGs for the Canadian company, Ormat will design, engineer, construct, deliver and install on-site the complete power system. For the REGs for the Canadian company, Ormat will design, engineer, construct, deliver and install on-site the complete power system. "We design specifically to the attributes of a site," explains Duncan. "So if there are certain criteria--output temperatures, input temperatures, volume, other restrictions--we'd design the most efficient unit for that need." Ormat offers its customers design, engineering, supply, installation and commissioning of a REG system at a compressor station site. "We also provide training and the appropriate manuals on how to operate and maintain the facility," Duncan adds. "The REG system control may be linked directly to the main control room of the compressor station at the site location. They can push a button and monitor the operations of the REG system." The electricity generated by the REG unit may be sold to a local utility. For the recently commissioned REG projects in North and South Dakota, Ormat's subsidiary entered into a 25-year power purchase agreement with Basin Electric Power Company where the projects will sell the electrical output to Basin Electric. The power generated by a REG system could also offset a major portion of the electrical needs of industrial facilities such as gas processing plants, cement plants, steel mills or glass manufacturing facilities. In some states, the power generated by REG facilities can qualify as green energy, thus meeting Renewable Portfolio Standards. In other states, REG facilities may qualify as energy efficient. An additional factor fueling recent growth in the renewable energy industry is global concern about the environment. Power plants that use fossil fuels generate higher levels of air pollution and their emissions have been linked to acid rain and global warming. A total of 22 states and the District of Columbia have all adopted renewable portfolio standards, renewable portfolio goals, or other similar laws requiring or encouraging electric utilities in such states to generate or buy a certain percentage of their electricity from renewable sources or recovered heat sources. With many U.S. states adopting renewable energy portfolio standards, Ormat expects the demand for renewable energy will create additional opportunities for the company to expand existing projects and build new power plants. have been running for years," says Duncan. "We are telling people it's a win-win situation with very little operational impact to them. Our customers understand that the REG systems are an innovative way to save more money while "This is a proven technology that has been field tested, and we can show people stations that operating their facilities."